A total of 22 National 12s gathered at Ripon Sailing Club on 6 October for the annual class open meeting. With fickle winds the race officer faced a challenge setting a suitable line and course. The wind changed direction right at the last minute resulting in an unusual running start. Howard Chadwick and Helen Nicholson sailed N2266 extremely well in the conditions, pulling out a considerable lead and claiming first place. 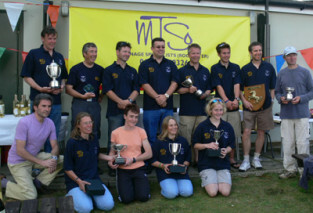 Mark and Kiera Fearnley proved that the winds suited both the vintage and double bottomed boats and finished second. Brian Herring and Gail Kaye were third. Race two got underway with a more conventional start and Ken and Andrew Mitchell pulled out the lead only to lose it when they sailed the wrong course. Their mistake allowed Philip and Helen David to take first, with Andrew and Trudie Wilkinson having a great race to claim 2nd. Vince and Alexander Phillips were 3rd. The final race was sailed in some of the best wind of the day, and Philip Benn and Terry Spence led from the first lap. A nail biting final two legs saw the Davids closing up on them but Benn and Spence held their cool to take first place, with the Davids in second place and Chadwick and Nicolson in third. The first vintage boat was N2266, sailed by Howard Chadwick and Helen Nicholson.